Shami Kitchen on Roswell Road in Sandy Springs has closed. The fast casual Mediterranean eatery opened last July in what was then the Kroger anchored Northridge shopping center at Roswell and Northridge Roads. The eatery occupied a 3,150 square foot space between the former Barnacles Sports Bar & Grill and Dollar Tree. A sign posted to the restaurant's front door confirms the closure. It's unclear exactly when it closed, but it appears to have been fairly recently. Unfortunately for Shami Kitchen, the center's Kroger announced it was closing last September, and by October, they were gone. The roughly 42,000 square foot Kroger store remains vacant today. The word “Shami” translates to “native of Damascus” - true of both Shami Kitchen’s founder, Abe Malla, and Executive Chef Abud Halabi. Malla is also the founder of Westside Market, a popular home furnishings store with one location on Ellsworth Industrial Boulevard on the Westside, and a second that opened earlier this year in Toco Hills. Malla indicated ahead of Shami Kitchen's opening that he planned to open additional locations of the restaurant in the future. While one could easily point to the departure of Kroger from the center - and the reduction in daily traffic it brought - as the reason for the closure, that may have been only one of the reasons. ToNeTo Atlanta visited the restaurant twice and found the food good, but not great, and certainly not as good as Al's Cafe Agora or Aviva by Kameel, both excellent local Mediterranean options. One issue may have been unclear promotions - 1/2 off entrees on Mondays - for instance, where one might think all entrees are half off, but families were told only one person in a party could receive half off, even if you paid separately. At least one Yelp review noted this policy and the user mentioned that she was "lectured" and "disrespected" in front of her family by the manager and that she was never coming back. 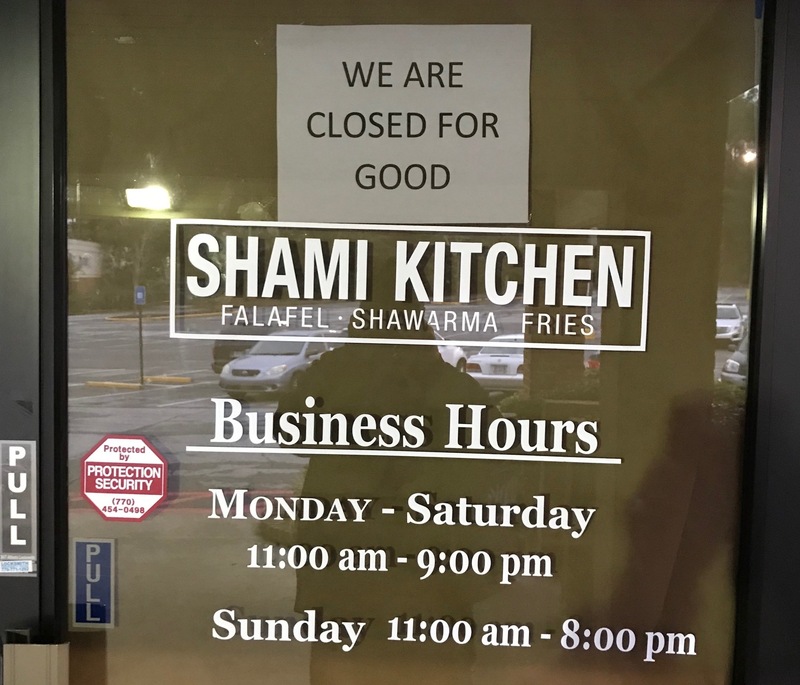 Shami's opening also put it competition with established Mediterranean eateries in the area such as Aladdin's Mediterranean Grill and Samad Grill, both less than two miles away. 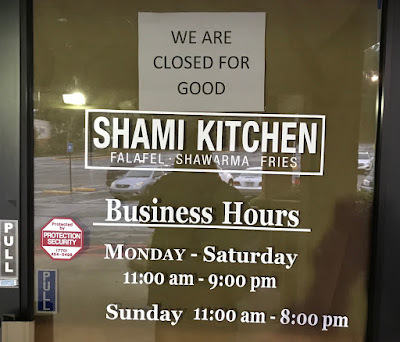 Are you surprised that Shami Kitchen closed? Where is your favorite Mediterranean restaurant in Sandy Springs? In Metro Atlanta? What would you like to see open in the former Shami Kitchen? No great loss ... Food was not good. Bye! I loved Shami Kitchen, I went there many times. It will be missed.